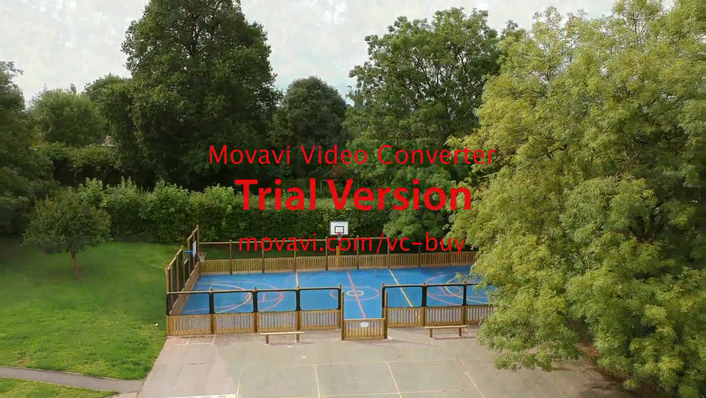 Come and visit our new Key Stage 2 playground! The children think it is absolutely fantastic and we would love for you to see it for yourselves! There will be an opportunity for a tour of the playground on Wednesday 19th September at 5.30pm before the start of 'Meet and Greet'. We might even let you climb on some of the equipment ;) See you there! A huge thank you to everyone who came to our disco last night. It was absolutely fantastic to see the children (and adults!) dancing, having fun, enjoying the snow (!) and eating lots of doughnuts! The children were amazing in our 'Dance off' and 'Sing off' competitions. We have so much talent in school! Also, who knew that a snow machine could be so much fun?! A big thank you to our DJ Paul Collyer for providing the tunes and entertainment for the evening. 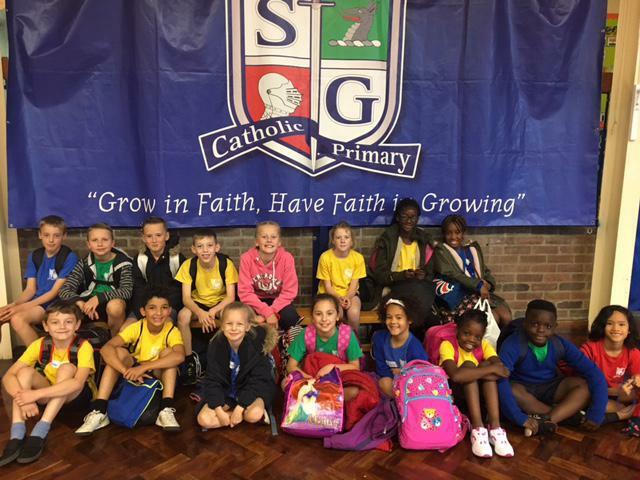 A huge thank you also to our 'Friends of St. George's' association who organised the event so well. We managed to raise £390, which will all be going towards the cost of transporting the whole school to the Pantomime in December. Today, Class 10 led us in a liturgy of Remembrance. 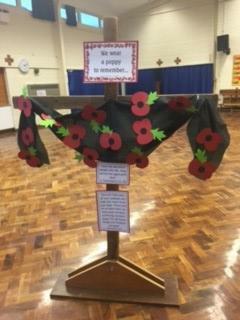 The whole school observed the 2 minutes of silence beautifully and listened so well as Class 10 told us about the meaning of Remembrance Day. It was a very thought provoking service. On Wednesday 23rd November and Thursday 24th November, we will be holding our 'Termly Learning Conferences'. 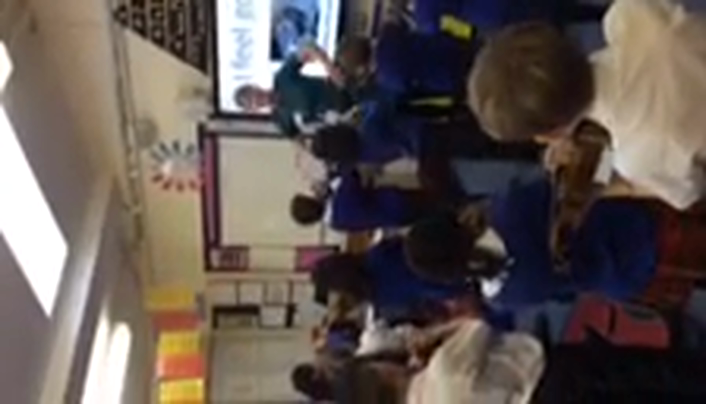 These meetings are jointly led by the child and the class teacher. During these meetings, targets for the term are agreed, best work is shown and areas for development are identified. The children then share their 'Brave Shields' which shows how well they are doing in terms of behaviour, reading at home, attendance, creating visually pleasing work (presentation) and completing extra work at home (homework). 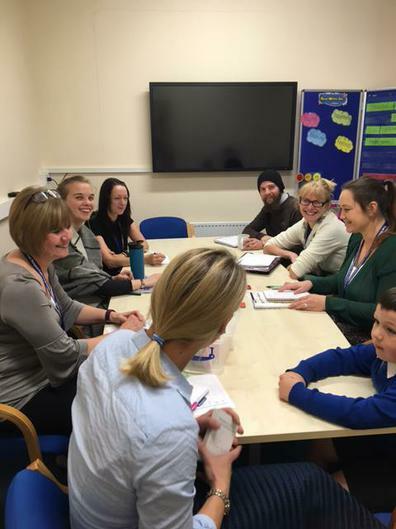 We feel that it's really important to involve the children in these meetings, as opposed to running the more 'traditional' types of parents evenings, because children are absolutely central to the learning that takes place in school. Please watch the video below, it gives you a sneaky peek into what you might expect during a TLC meeting! This afternoon, I couldn't help but visit our budding violinists in the Lower Juniors. You can imagine my surprise when I caught them playing 'I feel good' by James Brown - the perfect song for a Friday afternoon! See if you can spot some of the children getting carried away with their dance moves half way through... you can tell we had a disco last night! (Apologies for the horizontal view!). 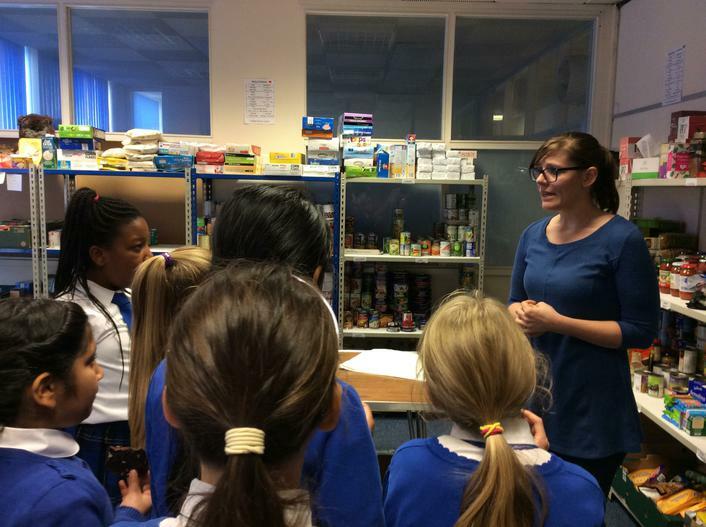 On the final day of last half term, our Charity Committee visited the Padley and Hope Centre food banks to deliver our Harvest gifts. The children really enjoyed getting out into our local community. They were struck by the good work done by both charities; so much so, that they have pledged to support the Hope Centre again during Advent. Indeed, they have come up with the ingenious idea of having a 'Reverse Advent Calendar' in school throughout December - with space each day to fill a 'door' with specific items required by the food bank. Our children are so thoughtful and caring! We are so proud of them! 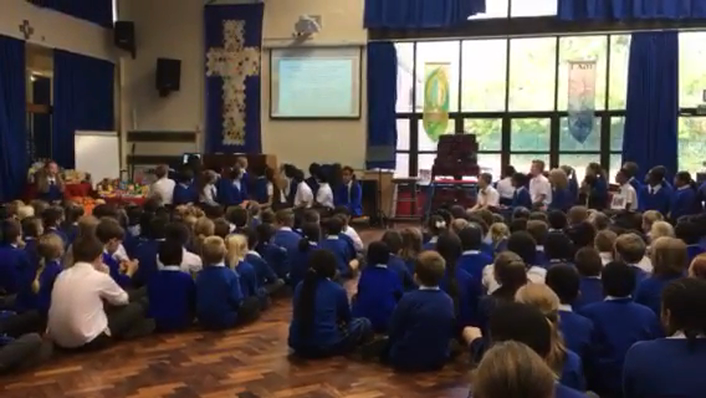 On Tuesday, we celebrated a wonderful All Saints' Mass, accompanied by our new music group, with readings and prayers led by Class 10 and 11. A huge thank-you to everyone who was involved and to everyone to came to join us. It was the best Mass so far - the singing was incredibly uplifting indeed! Finally, I'm really excited to tell you that in the next few weeks, we will be welcoming a team from 'Google Expeditions' to do some Virtual Reality History lessons with Key Stage 2. Lower Juniors will be visiting Ancient Egypt and Upper Juniors will be going back in time to World War 2. Very exciting indeed! I might just have to have a go myself! 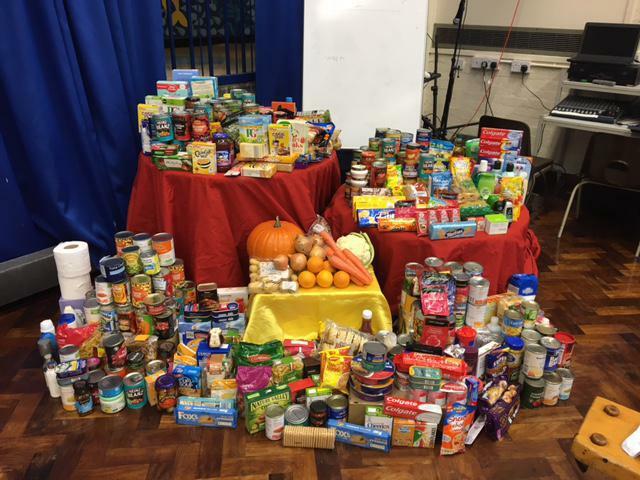 As we break up for half term, I would like to say a huge thank you to everyone for your kind donations of food and toiletries. Today Mrs Webster and I took our Charity Committee along with us to deliver the items to the Padley Centre and the Hope Centre. The children were fascinated with the work that both charities do and even got a drink of juice and a cookie from the people at the Hope Centre! An unexpected bonus! 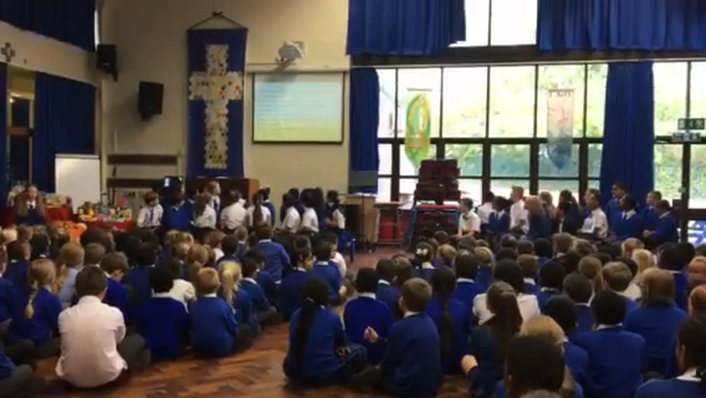 A big thank you also to Miss Lewis and Class 12 for leading us in celebrating our annual Harvest Assembly. We particularly enjoyed the singing - something I know that Miss Lewis is very keen on! Our very talented teachers getting ready to lead the singing for our next Mass. 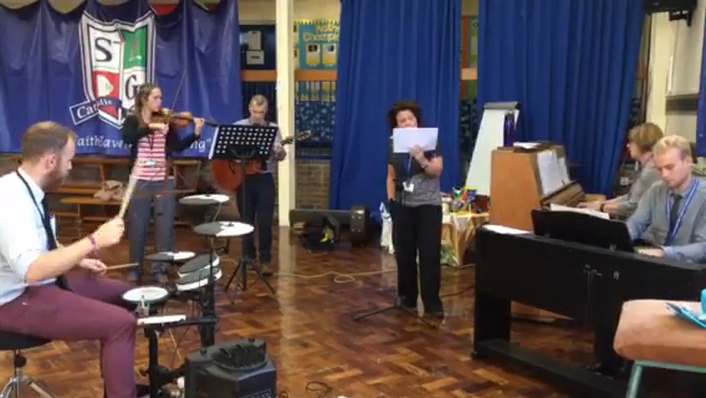 I can't wait for the children to find out that they will be accompanied by a full band! Today we had a visit from Beth from Read, Write, Inc. She came to train some of our teachers and teaching assistants in further developing their skills, especially in terms of delivering the new grammar content. Beth went into most of our Read, Write, Inc lessons this morning and was really impressed with the children's learning. Well done everyone!